Automating star rating bar in appium android software test is very easy, There will be star rating bar in many android software applications. Generally star rating bar is used to rate products, services in eCommerce android software applications. Mostly you will see 3 star and 5 star rating bars in such android software applications. If you wants to automate star ratings in appium android test then it is little tricky but very easy and we can do it using TouchAction class. Let's see how can we automate 3 star and 5 star rating bars of android software application using appium with example. We wants to automate 3 star and 5 star rating bars in android appium automation test. We will use API Demos app to automate star ratings. As you can see in bellow image, We wants to give 1 star on 3 star rating bar and 4 star on 5 star rating bar. In API Demos app, Manually you can navigate to above screen from Views -> Rating Bar. Create bellow given test in eclipse and run it using testng and appium. // Scroll till element which contains "Rating Bar" text If It Is not visible on screen. // Click on Rating Bar. //Set 3 StarRatingbar = 1 star. //Get start point of threeStarRatingbar. //Get end point of threeStarRatingbar. //Get vertical location of threeStarRatingbar. //Set threeStarRatingbar tap position to set Rating = 1 star. //You can use endX * 0.3 for 1 star, endX * 0.6 for 2 star, endX * 1 for 3 star. //Set threeStarRatingbar to Rating = 1.0 using TouchAction class. //Set 5 StarRatingbar = 4 star. //Get start point of fiveStarRatingbar. //Get end point of fiveStarRatingbar. //Get vertical location of fiveStarRatingbar. 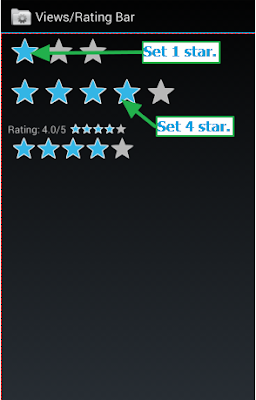 //Set fiveStarRatingbar tap position to set Rating = 4 star. //You can use endX * 0.2 for 1 star, endX * 0.4 for 2 star, endX * 0.6 for 3 star, endX * 0.8 for 4 star, endX * 1 for 5 star. //Set fiveStarRatingbar to Rating = 4 star using TouchAction class. As you can see in above test, I have created 2 @Test methods. 1st @Test method will give 1 star rating on 3 star rating bar and 2nd @Test method will give 4 star rating on 5 star rating bar. If you wants to increase or decrease star rating then you can set value of tapAt as per your requirement as describe in test comment. This is the way to handle star rating bar in android software application automation test using appium.